The DAX index ended Monday's session in the red shedding half a percent on worries that the financial crisis in Turkey could affect the international banking system and the broader economy. Today, German stocks are opening flat to slightly higher as the Turkish lira stabilized and a slew of Chinese data on industrial output, retail sales and fixed asset investment came in slightly below expectations. Also in focus this morning was the release of German GDP data. Gross domestic product climbed 0.5% beating expectations, however the German index only moved a little higher following the release, suggesting investors are more affected by geopolitical tensions for now. The German Index bounced off its support level on Monday as predicted and is expected to open flat to slightly higher today. We may see this correction continue at least until the start of the U.S. trading session or until the old support turned resistance at €12,500 is reached. 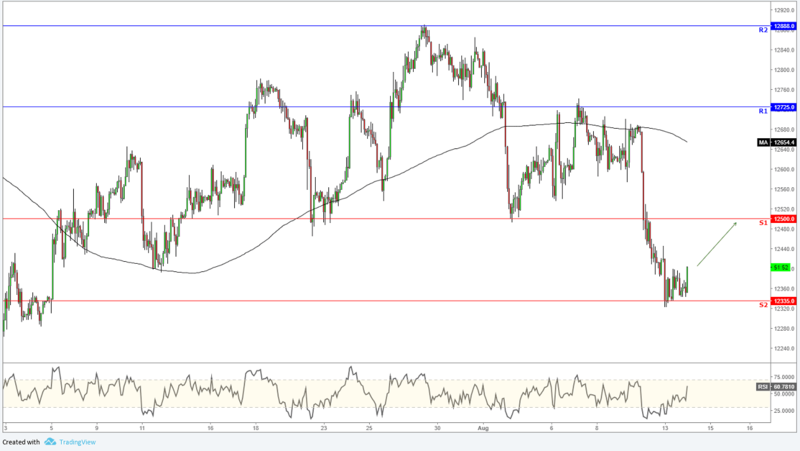 The RSI looks mixed to bullish signaling a correction back up to the €12,500 level.